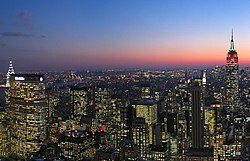 Midtown Manhattan at dusk, as seen soothwaird frae Rockefeller Center in Januar 2006. Burgh o Manhattan shown in orange. Manhattan (/mænˈhætən/) is the maist densely populatit an smawest in aurie o the five burghs o New York Ceety. Locatit primarily on the island o Manhattan at the mooth o the Hudson River, the burgh is conterminous wi New York County, an oreeginal coonty o the state o New York. The burgh an coonty consist o Manhattan Island an several smaw adjacent islands: Roosevelt Island, Randall's Island, Wards Island, Governors Island, Liberty Island, pairt o Ellis Island, Mill Rock, an U Thant Island; as well as Marble Hill, a sma aurie on the mainland borderin the Bronx. The oreeginal ceety o New York began at the soothren end o Manhattan, expandit northwaird, an then atween 1874 an 1898, annexed laund frae surroondin coonties. ↑ New Jersey v. New York, 523 U.S. 767 (1998). Retrieved January 4, 2008.